Poster from the US, World War II era. The caption says: “STAY ON THE JOB UNTIL EVERY MUDERING JAP IS WIPED OUT!”. Note that such style of propaganda wouldn't be used today on American audience because the social climate has changed. The racial tone would create a backlash. Note the ungrammatical phrase there. It reinforces the idea that Japanese do not speak our language. Also note the Asian-styled typeface, and the evilized Japanese facial characteristics. This piece works because majority of white Americans are Christians. This painting (circa 1872) by John Gast called American Progress is an allegorical representation of Manifest Destiny. In the scene, an angelic woman (sometimes identified as Columbia, a 19th century personification of the United States) carries the light of “civilization” westward with American settlers, stringing telegraph wire as she travels. American Indians and wild animals flee—or lead the way—into the darkness of the “uncivilized” West. 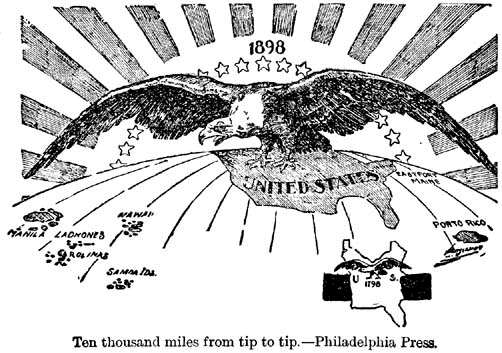 Ten thousand miles from tip to tip — Philadelphia Press. Bolshevik propaganda poster of Leon Trotsky slaying the dragon of counter-revolution, 1918. The picture alludes to an icon of St. George (Георгий Победоносец) slaying a dragon, popular in the Russian Orthodox church. The inscription on the worm says Counter-revolution. North Korean propaganda showing a soldier destroying the United States Capitol. Frames from Japanese propaganda animation using Mickey Mouse. The date of this animation seems to be 1934.